Mt Abu, the only hill station in the state of Rajasthan is the highest peak in the Aravalli Ranges and is located at an altitude of 1200m. The highest peak here is the Guru Shikar, which has a temple of Guru Dattatreya. At a little distance is another peak on which stands the temple of Ahilya, the mother of Dattatreya. The view from Guru Shikar is spectacular. 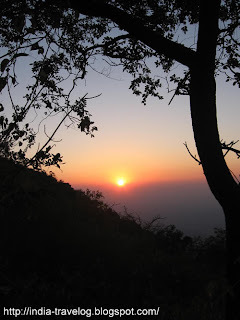 To reach Guru Shikar you need to travel around 7kms on the Dilwara-Achalgad Road. 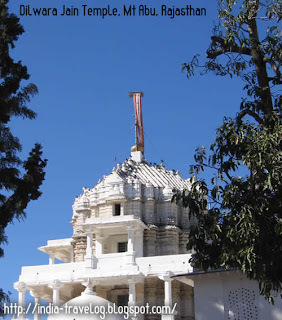 Mt Abu is also famous for the Jain temples, the most famous being the Dilwara Jain temple. The temple like other Jain temples has exquisite marble carvings. It looks simple form outside but the interiors are beautifully carved - the work of extremely skilled artisans. There are five main sections inside the temple. 1. Sri Mahavir Swami Shrine- devoted to Lord Mahavir. 2. 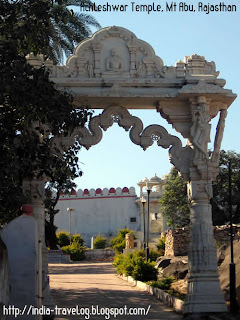 Sri Adinath Shrine - this is the oldest of all the sections and is dedicated to Sri Adinath, the first Jain teerthankar. 3. Sri Parsavanath Shrine - devoted to lord Parsavanath and has four mandapas. 5. The Luna Vasahi Shrine - dedicated to Lord Nemi Nath. An unique feature of this temple is the "Rag Mandapa" which houses 360 tiny idols of Jain tirthankaras. The temple is open to public from 12-3pm. Jains can visit it in the morning session too. No entry fees. Cameras and mobiles are not allowed inside. Hence, I could only get a picture of the temple from the outside. Achalagad Fort - Enroute to Guru Shikar, around 7 kms from Mt Abu town is the Achalgad fort which was built by Rana Kumbha of Mewar. It houses several Jain temples and the Kaninath temple. 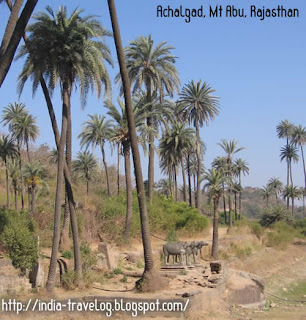 Another temple - the Achleshwar temple near the foothills of Achalgad is famous for the Nandi which it houses. The Nandi is made up of 5 metals(Panchdhatu) and is said to weigh more than 4 tonnes. 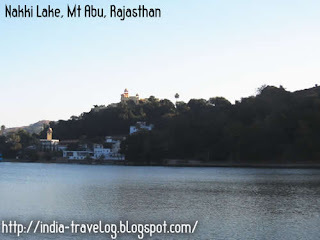 Nakki Lake - situated within walking distance of the main market in Mt Abu, is a picturesque spot. 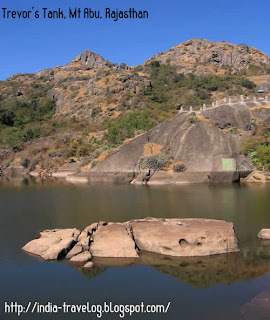 Surrounded by rocky hills, it is the favorite spot for families and visitors to spend their evenings. 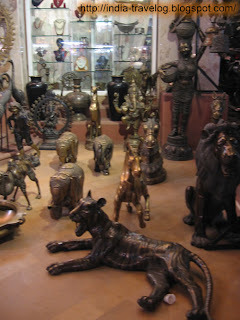 There are many temples in Mt Abu in addition to the Jain temples. There is the Adhar Devi temple, the Raghuntah ji temple and the Durga temple. The world headquarters of the Brahma Kumaris is also located in Mt Abu. 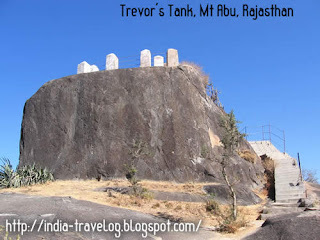 Trevor’s Tank - Around 5 kms from Mt Abu market is the Trevor's tank built by a British engineer with the same name. At Trevor’s Tank you can spend time relaxing at the tank. The tank was used once upon a time to breed crocodiles. You can trek up to the vantage viewpoints inside the park. If you are lucky you might spot some birds. We saw lot of cages, which were no longer in use. 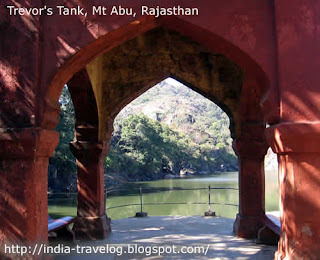 Trevor’s Tank forms a part of the Wild life sanctuary in Mt Abu. Evenings can be spent at the Sunset Point. There was a mad rush to reach the Sunset point and it looked like that the entire residents of Mt Abu had converged on the Sunset Point. Lot of hawkers selling corn-of-cob, chat items, roasted groundnuts, fruits, popcorn dot the stretch to the Sunset point. The Sunset point itself was not very spectacular. Can give it a miss. 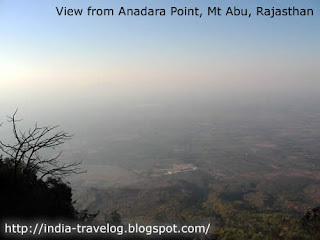 Instead you can go to the Anadara Point which looked less freqented by visitors and offered a good view. There are numerous eateries in Mt Abu - from the roadside vendors to the star hotels. Same goes for accommodation too. Bikes are available on hire. While hiring bikes make sure you take just sufficient fuel. If needed carry extra fuel in a bottle so that you can return it if not used. Once you fill up the fuel tank and incase you haven’t been able to use up the fuel, they don’t refund the money. There are lot of options for Shoppers too - from the bargain shopping to the luxury malls. Overall a nice place to spend a couple of days.